The town is Fowler, Michigan, a middle-class community with 1,100 residents – and 2,500 wedding dresses. The building is Becker’s Bridal, home to each of those dresses, a figurative blizzard of white. In THE MAGIC ROOM: A Story About The Love We Wish For Our Daughters, Jeffrey Zaslow takes readers to this remarkable small-town bridal shop to explore the hopes and dreams that parents have for their daughters. He weaves this true story using a reporter’s research and a father’s heart. Jeff came to Fowler not just to write about wedding gowns and what they represent. He came to understand the women wearing them, their fears and yearnings, and through them, he tells a larger story about the love between parents and daughters today. Run by four generations of Becker women since 1934, Becker’s has witnessed transformations in how America views the institution of marriage; some of the shop’s clientele are becoming stepmothers, some are older brides, some are pregnant. In THE MAGIC ROOM, you’ll also meet the owner of Becker’s Bridal, Shelley, and learn the ups and downs of her life. She has a special affection for all the brides who enter the “Magic Room,” hoping their journeys will be easier than hers. Among the visitors to Becker’s is Megan, a woman whose middle name honors the sister she never met – a sibling who died in an accident before Megan was born. 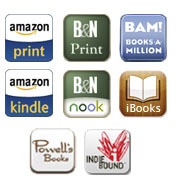 Now an accident of her own has left Megan’s wedding in jeopardy. Bride-to-be Julie stands on the “Magic Room” pedestal for the second time. It is a moment of joy and tears – for though she is happy to love again, the memory of her late first husband lives on within the two daughters who accompanied her to Becker’s. Erika, meanwhile, has come to the shop with her three sisters. All of them had vowed to save themselves — and even their first kisses — until they found their husbands-to-be. THE MAGIC ROOM illuminates the most poignant aspects of a woman’s journey to the altar. The stories here are more than mere tales of brides-to-be – they’re illustrations of the ways in which all parents wish their daughters will go through life safe, happy and surrounded by love. The “Magic Room” offers visceral reminders of the challenges young women face, of the ways in which sadness is so often intertwined with joy, and of the sweet possibilities that await them – or that may be beyond their grasp. 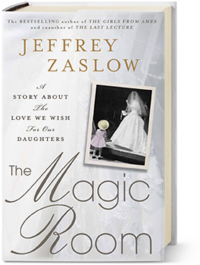 The lessons Zaslow shares from within the “Magic Room” are at times joyful, at times heart-breaking. And each bride who passes through Becker’s Bridal has a story to tell – one that carried her there, to that dress, that room, that moment.